OAKLAND, Calif. (CNS) — The local Catholic community in Oakland — parishioners, priests, school students and Catholic Charities’ workers — have been offering prayers and support for victims of the Dec. 2 fire that erupted in an Oakland warehouse, killing 36. The fire started during a dance party at a warehouse that had been converted to artists’ studios and illegal living spaces, dubbed the “Ghost Ship.” The cause of the fire, reported to be the most lethal building fire in the U.S. in more than a decade, has not been determined. “We owe it to the community and those who perished in this fire, and those who survived the fire to be methodical, to be thorough, and to take the amount of time it takes to be able to look at every piece of potential evidence,” said Alameda County District Attorney Nancy O’Malley, according to The Associated Press. “We also pray for the first responders, medical personnel and others who are aiding the victims and their loved ones. We will be remembering the deceased in our Masses this weekend throughout the Diocese of Oakland,” he said. Among the Catholic groups to offer prayers for the fire victims were participants in an annual pilgrimage in Oakland honoring Our Lady of Guadalupe. Early in the morning of Dec. 3, Hector Medina, coordinator for Latino ministries, learned that the planned route would have to be modified in the aftermath of the fire. The pilgrimage, with the good weather, was larger than expected, with more dance groups and floats than usual. Along the route, there was music and prayer but when pilgrims were near the location of the fire, the music was silenced out of respect, Medina said, noting the only sounds were those of prayer. Once the pilgrimage reached the Cathedral of Christ the Light, prayers for those lost in the fire — at that time, the number was unknown — were offered during Mass. Each Mass at the Cathedral of Christ the Light the weekend of Dec. 3 and 4 began with a moment of silence for the victims of the fire, said Father James Matthews, the cathedral’s rector. 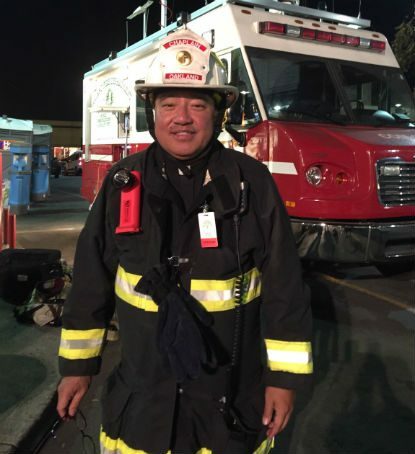 After the fire, Father Jayson Landeza, pastor of St. Benedict Parish in Oakland and chaplain to the Oakland Police and Fire departments, was assisting family members. He was seen in numerous news television clips walking into the family assistance center the city set up for those awaiting word on their loved ones. During the Dec. 3-4 weekend, administrators at St. Elizabeth High School, located just a few blocks from the site of the fire, checked in with their students and determined they were all well. When school resumed Dec. 5, students were told that counseling was available. Staff members checked in with students they thought might be affected by the fire. No one knew any of the victims, but most of the students wanted to do something to help, said Betty Uribe, a school counselor. They were particularly concerned about the people waiting at the family assistance center in their neighborhood. “This shows how resilient and relentless they are in wanting to serve others,” Uribe told The Catholic Voice, Oakland’s diocesan newspaper. The first calls for Catholic Charities of the East Bay’s crisis response services came from the Oakland Unified School District, seeking assistance at a school that had lost a teacher in the fire and from people who had been helped in the past and wanted to refer friends, said Mary Kuhn, communications director. The social services arm of the Catholic community of the East Bay was assessing its resources and looking for the best ways to offer assistance, Kuhn said. Parishes near the fire were being asked what help they needed to meet the needs of people who might be coming to their doors. 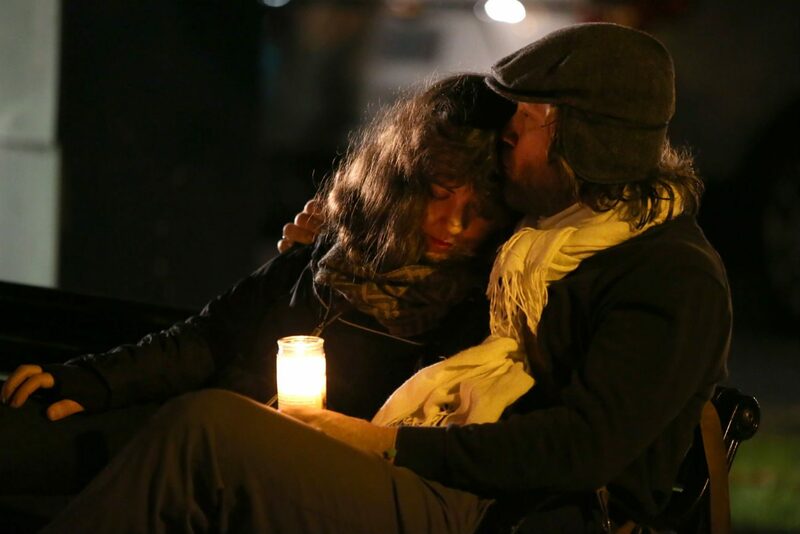 On Dec. 5, hundreds attended a vigil at Oakland’s Lake Merritt for those who died in the fire. Just before the vigil, a few handfuls of people — alone or in small groups — came to the Cathedral of Christ the Light for quiet prayer. Once the recovery efforts at the fire site have been completed, the cathedral will host an interfaith prayer service for the victims and first-responders, Father Matthews said. Contributing to this story were staff members of The Catholic Voice, newspaper of the Diocese of Oakland. PREVIOUS: Black pro-life leaders hold rally outside Planned Parenthood in D.C.